Scott sued as a candidate for the U.S. Senate, not in his capacity as governor of Florida. TALLAHASSEE — A visibly frustrated Gov. Rick Scott on Thursday accused "unethical liberals" of trying to steal a U.S. Senate seat from him, as his campaign filed a lawsuit against election officials in Broward and Palm Beach counties for allegedly refusing to release voting tabulations. 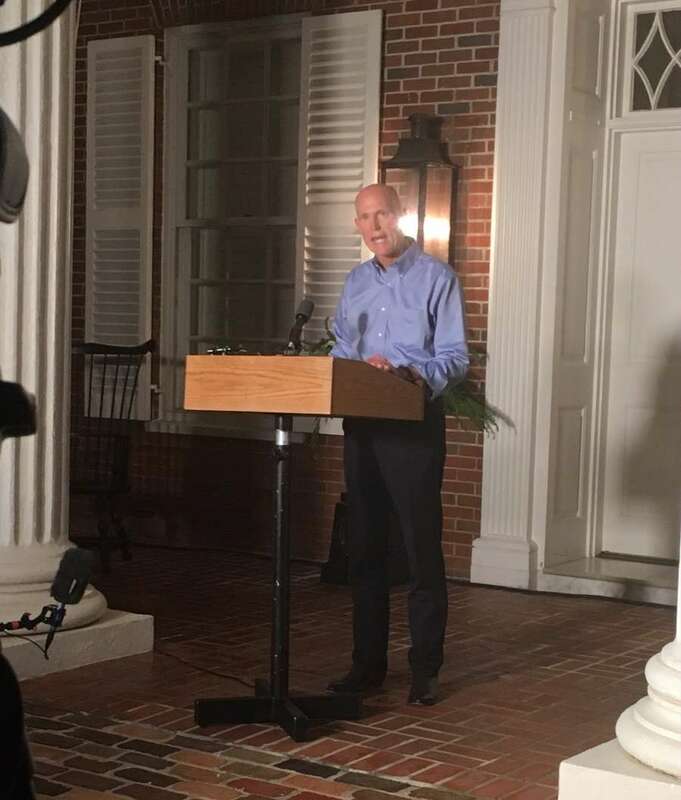 "I will not sit idly by while unethical liberals try to steal this election from the great people of Florida," Scott told reporters on the front steps of the stately Governor's Mansion in Tallahassee. The targets of Scott's wrath were Brenda Snipes, the Broward County elections supervisor, and Palm Beach supervisor Susan Bucher. Both officials are Democrats; Scott is a Republican. President Trump chimed in on Twitter, describing, without any evidence, a "big corruption scandal" involving election fraud in South Florida. Scott took the unusual step of delivering a partisan political attack from his taxpayer-funded residence, which is reserved for official state events. He cited a ruling by a federal judge in which Snipes was cited for illegally destroying ballots in a 2016 congressional election. During his eight years as governor, Scott himself has been sued multiple times for violating public records and Sunshine laws. Scott's lead has steadily eroded since he declared victory Tuesday night. He ordered the Florida Department of Law Enforcement to investigate Snipes, two days before counties are required to report their unofficial returns to state elections officials. "Their goal is to keep mysteriously finding votes until the election turns out the way they want," Scott said. After delivering a six-minute statement, Scott turned and headed back into the mansion quarters and refused to take questions from reporters. A Nelson spokesman shot back in response to media questions about Scott's allegations. "The goal here is to see that all the votes in Florida are counted and counted accurately," said spokesman Dan McLaughlin. "Rick Scott's action appears to be politically motivated and borne out of desperation." 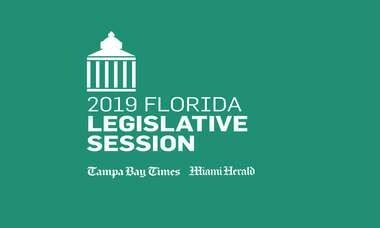 Numbers being reported from one of the state's bluest bastions are raising questions about why so many fewer voters appeared to choose a candidate in the U.S. Senate race, Florida's most nationally prominent office on this year's ballot. Scott claimed "left-wing activists have been coming up with more and more ballots out of nowhere." Scott's first suit, claiming Snipes has violated public records laws by not complying with his campaign's requests for voter and ballot information, was filed in Broward Circuit Court in Fort Lauderdale. Scott and the National Republican Senatorial Committee requested an emergency hearing. 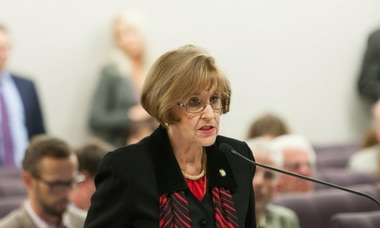 A second suit, naming Bucher, asserted that the Palm Beach County supervisor's office refused to allow party representatives " to properly witness Defendant's processing and duplication of physically damaged absentee ballots," an alleged violation of state law, and that the elections office "failed to allow the Palm Beach County Canvassing Board to execute its statutory duty to determine 'all valid votes' from 'overvoted' and 'undervoted' absentee ballots." Three statewide races, including Scott's own against Nelson, hang in the balance. Scott's lead shrank by about 6,800 votes on Thursday as results trickled in from around the state, including Broward. In the race for governor between Republican Ron DeSantis and Democrat Andrew Gillum, the margin shrank from .52 percent to .44 percent Thursday, in the range for a machine recount. DeSantis' lead was 36,223 votes, down about 6,700 as of Thursday morning. In the most significant swing, the race for commissioner of agriculture changed completely. The day started with Democrat Nikki Fried trailing Matt Caldwell by about 4,000 votes, but by the time the governor started speaking, Fried was ahead by about 2,900 votes, .04 percent. Incoming House Speaker Jose Oliva, R-Miami Lakes, released a statement Thursday night supporting Scott's request for an FDLE investigation. "As the other 65 counties know too well, this is not the first time Palm Beach and Broward counties have failed its citizens — but it should be the last," he wrote. "The power of the vote is only as strong as the trust in the count. With each new ballot 'found' that trust erodes."